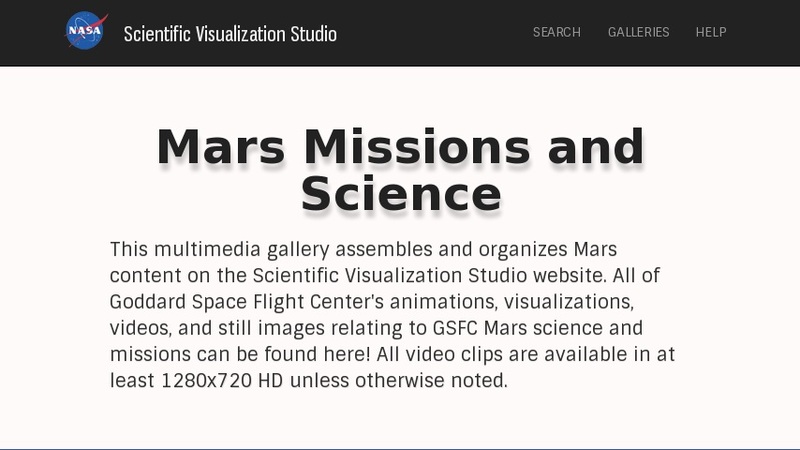 This site from NASA's Scientific Visualization Studio features many images and animations of the planet Mars. These visualizations were created using data acquired from various satellites and instruments, such as the Mars Orbiting Laser Altimeter (MOLA) and the Mars Polar Lander. Visualizations are divided into four groups depending on instrument or topic; MOLA, Mars Oceans, Mars Polar Lander, and Mars Seasonal Snow Variations. Animations are available in varying formats and file sizes, and the original digital images used to make these animations have also been made accessible. High and low resolution stills created from the visualizations are also included, with previews for selective downloading.